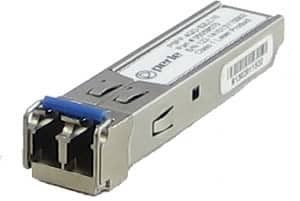 PSFP-1000D-S2LC10-XT Gigabit SFP Optical Tranceiver. 1000Base-LX/LH 1310nm single mode (LC) [10 km/6.2 miles]. -40 to 85C industrial extended operating temperature. DOM ( DMI ) - Digital Optical Monitoring. Perle'sFP Optical Transceivers are interchangeable, compact media connectors and enable a single network device to connect to a wide variety of fiber and copper cable types and distances. For use with Perle'sFP Media Converters and third party equipment that supports MSA compliant SFP transceivers. For complete product details and technical specifications, please visit our SFP Optical Transceivers Product Page.